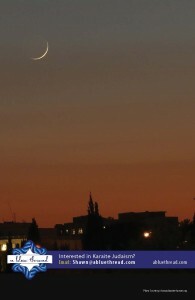 Crescent new moon in the Land of Israel. We hear a lot these days of “identity politics.” Today, I explore “identity halacha” and realize that my religious Karaite identity is slowly getting turned on its head. And I’m fine with that. 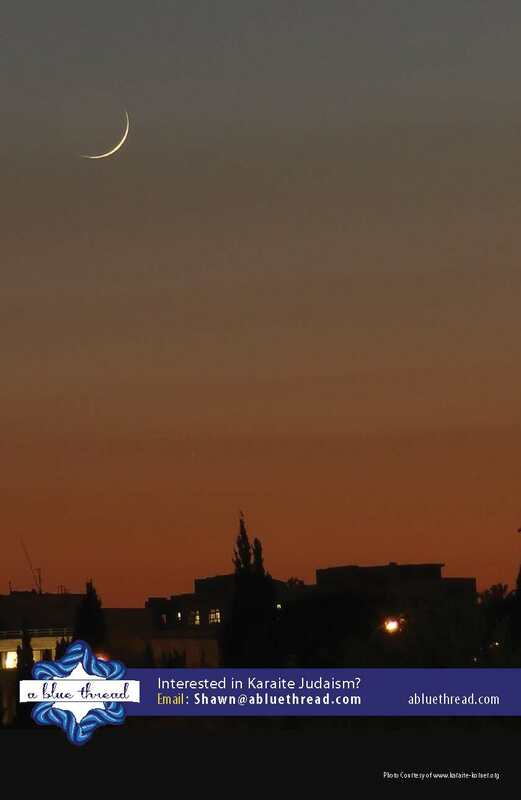 For approximately 15 years, I have been a zealous advocate of using the moon in the Land of Israel to determine when to observe our holidays in the Diaspora. 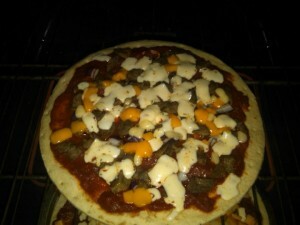 I set this forth in a book. I stated this in a Karaite Fact Card. And I couldn’t count how many times I stated this at the Karaite synagogue. But over the last year, I’ve come to realize that I might have been wrong. Today, I catch up with Moshe Firrouz. 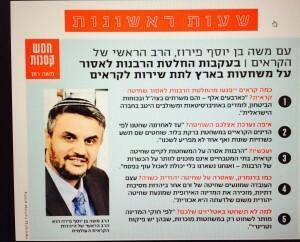 Although I’ve known Moshe personally for almost 10 years, it is still a bit odd for me to refer to him without a title. 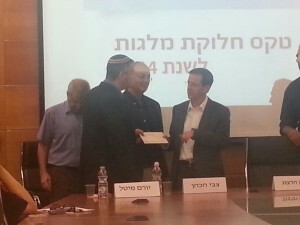 After all, he is the Chief Hakham of the Karaite Community. But Moshe cares more about serving Hashem than he does about titles. 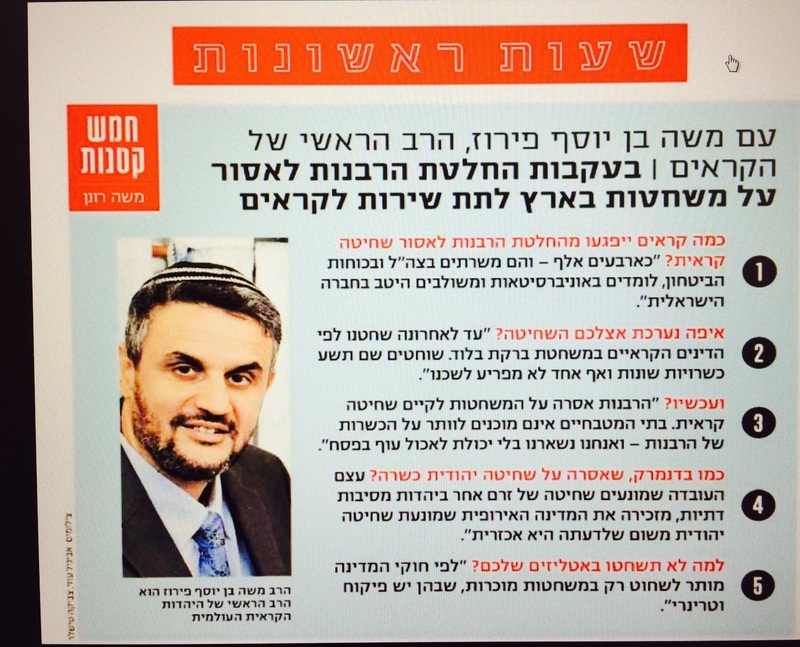 From Yediot Aharanot: Questions and Answers with Hakham Rashi Moshe Firrouz about the recent ban on Karaite slaughter. Those who follow the blog regularly know that I have tremendous respect for the Rabbinic tradition. (See here and here.) Heck, I have even professed my “support” for the Rabbanut. 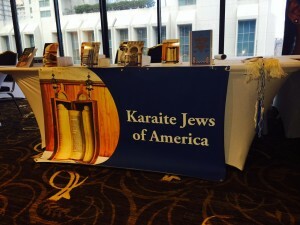 The Karaite Jews of America’s Booth at JFNA’s TribeFest. Eli Shmuel and I are here in New Orleans at the Jewish Federation of North America’s TribeFest 2014 – which is awesome so far. 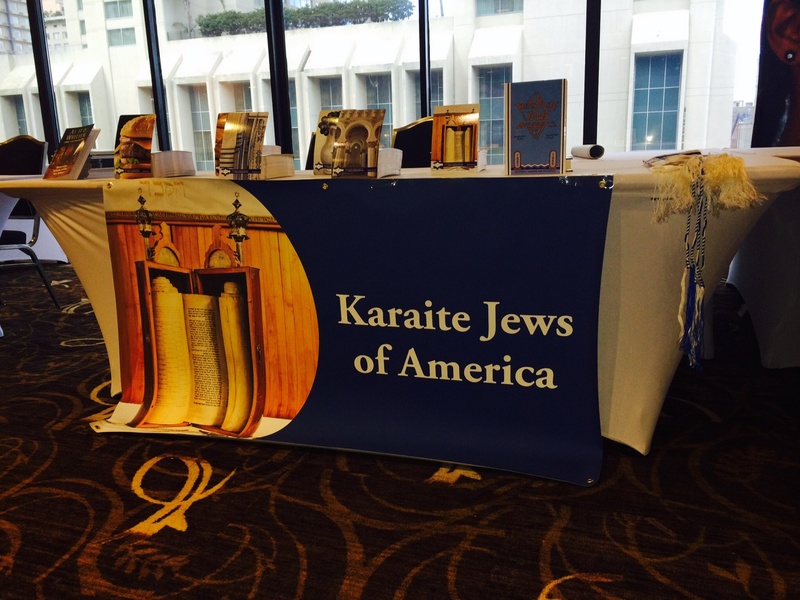 Over Shabbat, Eli and I were discussing whether we (Karaites, Rabbanites, others) know the true color of techellet. And the conversation led me to one of the most profound realizations of my young life. A Karaite Shochet’s First Meal: Goat Pizza. By now, we all know that Karaites and Rabbanites have different traditions regarding kashrut (e.g., milk and meat and alyah). But the historical Karaite practice of slaughter (Hebrew: shechita) is also different from the Rabbinic practice. Were any Karaite Divorce Documents Found in the Cairo Geniza? The Karaite halakha actually makes an occurrence like this virtually impossible. Did Phil Ivey put a stumbling block in front of a blind man to the tune of $12 million? Ivey contends he did not violate any laws; but I wonder whether his actions violated the Torah.